Looking for Recorded TV Manager 4.1? Click here. This is Beta software and may contain errors or other problems. Please sent comments and suggestions to support@fjdrasch.com. This software is specific to TV recordings made by Windows Media Center. This software is not a video player, it is a file selection utility specifically designed for watching episodic TV recording collections. tvPlayNext is designed to simplify watching collections of Media Center recorded TV programs on Windows 10 (W10). Since Microsoft has explicitly removed Media Center from W10, we need another way to select and play those TV recordings (dvr-ms and wtv). SELECT - First identify the network folder which holds the recorded TV collections. tvPlayNext will then access the metadata stored in those recordings and display the files by series name and original air date rather than by filename. This organization is intended to facilitate watching a series from start to finish. Note that you can change the folder by clicking the "Change" button on the bottom app bar on the tvPlayNext main page. You can open the bottom app bar by either swiping up from the bottom or right-clicking the page background. PLAY - In order to play recorded TV the host system must have some sort of app which can play Media Center files. 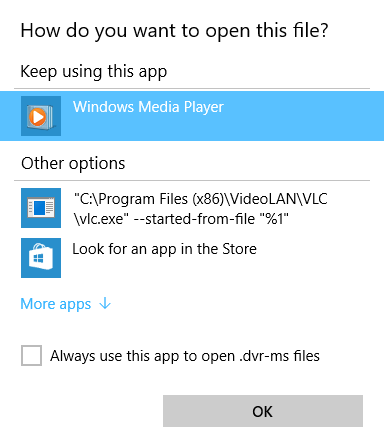 There are media player apps in the W10 store, search on "Media Center". VLC Media Player also works with TV files. Windows Media Player will also play TV files if the right codecs are installed. If you have a particular app that works for you, let me know and I will post additional information here as it becomes available. When you press or click the PLAY button the software will open the TV file using the default video player for the file type being played (dvr-ms or wtv). Note that the program 'remembers' the last watched episode and will pre-select the next recording by original air date in subsequent lists. This software has not been tested under all screen resolutions. In some cases, the tvPlayNext screen will need to be resized when first run. The window frame is resizable and should remember the change in subsequent sessions. I worked with Microsoft Technical Support on this. This is a limitation in W10 which will not get fixed because it involves Media Center. There is also no work around for this problem. Fortunately it is only minor and require just one more press or click to continue. As long as there is an appropriate app registered as the default app for dvr-ms or wtv files, it will work as intended.